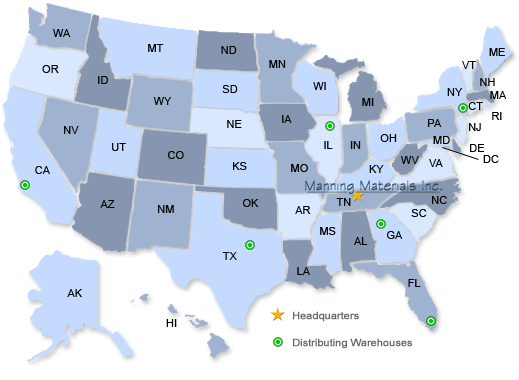 Manning Materials is located in Nashville, Tennessee, and has been in business for over 50 years. Established in 1957 by Roy Manning, Jr., the company started as a manufacturer’s agent representing suppliers of architectural specialties for the construction industry. Now expanded to include three generations of the Manning family, we have a full team of sales professionals and expert installers of bathroom toilet partitions and accessories. Over the years, we have been very fortunate to have furnished materials for construction jobs from coast to coast, including HCA Hospitals, Vanderbilt University, Opryland Hotel, the Grand Ole Opry, Bridgestone Arena, and LP Field, Home of the Tennessee Titans NFL team. Whether you are a construction company we have worked with for so long we’re on a first-name basis, or this is the first you’ve heard of us, call us for your next project, and we will be happy to help. We’re not just here to sell you the bathroom toilet partition materials and accessories you need right now. We want to be the place you come back to for years to come. Because at Manning Materials, we know this business isn’t just about building – it’s about building business relationships.